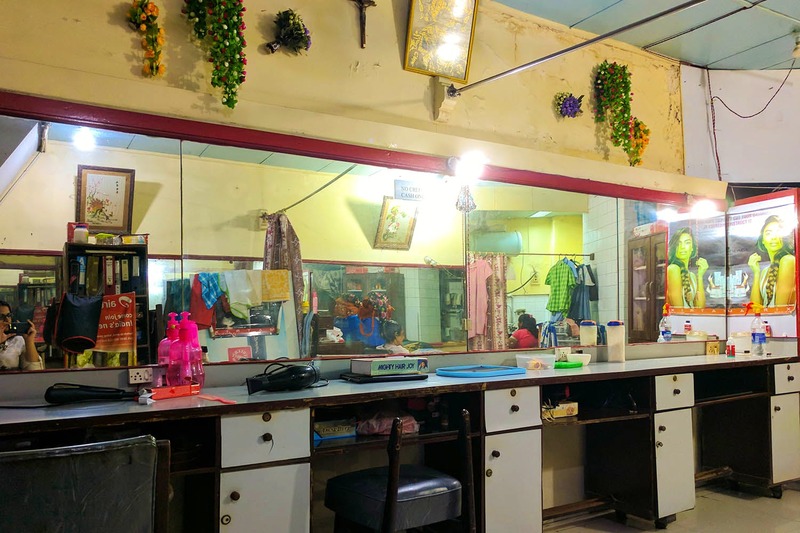 We’ve been visiting Bhang Ladies Coiffeur ever since I’ve been a child and while most of us go to Colaba for street shopping, we never miss a chance to visit our old favourite salon for a haircut and the works. Run by the third generation of Bhangs, a Chinese family who had migrated from Guangdong, this place has seen a lot of history, from shoemakers to finally hair stylists in this new era. Nothing has changed when we talk about Bhang, the beauty parlour my mum and I have been visiting for over 10 years now. The only sign that grabs your attention is Ling’s Pavilion right next door, and an old wooden signboard painted yellow with ‘BHANG’ written in bad cursive and red font. But, we excuse them, for everything else within has been treasured for a long while. George Bhang manages the souvenir shop in front (his father was a famous shoemaker who made shoes for the cast of Gandhi) while his wife Glynda is famous for her hair snipping skills. Enter the salon and you’re greeted by Glynda and her team, where they take the time to get to know you personally and cut your hair (INR 300), threading (INR 50), hair wash and blow-dry (INR 600), waxing (INR 500), bridal makeup (INR 4,000), and others. While she uses the latest products (Matrix, Wella, Loreal and the likes), we would want her to expand it by doing manicures and pedicures with a range of colours and other such trends. But honestly, there’s so much to love about their establishment that one can’t truly find a fault. It’s a gem in the city and we know it. If you want a haircut, ask Glynda to tell you what will suit your face and the style. She’ll give you tips to take care of your hair in every season and how to naturally improve your skin. She’s always ready to pass down some advice, so make sure you have a chat with her.